The WJF211J.BA0570 TAG Heuer Link Calibre Automatic Roman Numerals Men’s Watch is part of the latest additions to the Link line, and was recently debuted at the Basel Fair in Switzerland. Not yet available to the public, this watch will surely be popular when it is released in the Spring of 2010. 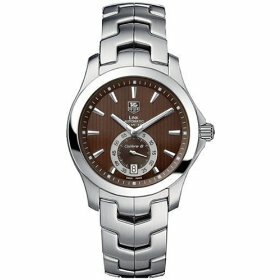 The TAG Heuer Link Calibre Automatic Roman Numerals is noteworthy for its indexing. As its name suggests, this watch features Roman Numerals as its indexes instead of Arabic numerals. These are plated in Rhodium and are set on a striking black dial, giving the watch a sophisticated look while still being easily readable. At 6 o’clock, the timepiece features a subdial that measures seconds and a date window. The hands are plated in Rhodium and are luminescent, making the time still legible in the dark. The Link Calibre Automatic Roman Numerals boasts a case made from fine-brushed stainless steel. It features an anti-reflective curved glass crystal that has been treated on both sides for maximum visibility. The case back is made from a scratch-resistant sapphire crystal that features a black “150 Years” logo and engraving exclusive to this particular watch. The watch is water resistant to 200 meters.